file tersebut berhubungan dengan Visual C++ Redistributable for Visual Studio 2015. 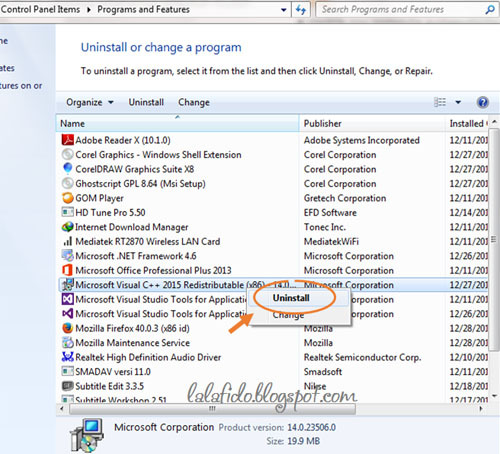 Masuk Control panel >> Programs and features>>pilih microsoft visual c++ 2015>> Uninstall. 2 Responses to "sytem error program can’t start because api-ms-win-crt-runtime-|1-1-0.dll coreldraw x8"
This window indicates the incorrect operation of the current extension. It happens like this, after manipulating the file: deleting, changing, or an out-of-date version. The library files are installed with the operating system or drivers and are replaced with a general update. Here you may api-ms-win-crt-runtime-l1-1-0.dll download https://fix4dll.com/apimswincrtruntimel110_dll straight ahead from the link. I had such a problem, most likely, it happened because the whole house was shorn off the light. After that, I set up my computer for a long time.